It started in an Icelandic bank, curiously observing two elderly, intoxicated men being politely escorted from the premises by amiable security guards as I waited to exchange euros into króna. I had just arrived in Reykjavik, a tiny cosmos abundant with socially and politically expressive street art and culture, where the sun was out shining and the homeless merrily drank from plastic bags in the city’s parks alongside the upper crust in swank side-walk cafes. Three years earlier three of the country’s major privately owned banks collapsed, resulting in a financial crisis, the migration of 5,000 of it’s 316,000 population, together with demonstrations and riots held by fiery Icelanders as part of the Búsáhaldabyltingin or ‘kitchenware movement’. Refusing to pay the debts incurred by the country’s financial institutions, a social uprising was created and, facing pepper spray, tear gas and batons, protesters banged pots and pans, threw snowballs, eggs, toilet paper and skyr (icelandic yoghurt) at Parliament House in downtown Reykjavik, demanding the resignation of the government and voicing their disapproval until a date for parliamentary elections were set in April 2009. In a country previously deemed notoriously expensive, the resulting decline in the króna had been an incentive to travel here and trek through the famed Landmannalugar highland region on one of the world’s most exceptional multi-day treks. Four days later, surrounded by luminescent moss and arctic wildflowers, I lay prostrated, my fatigued muscles immersed in the steaming waters of the Landmannalaugar Hot Springs, an exhaustion drenched in satisfaction. 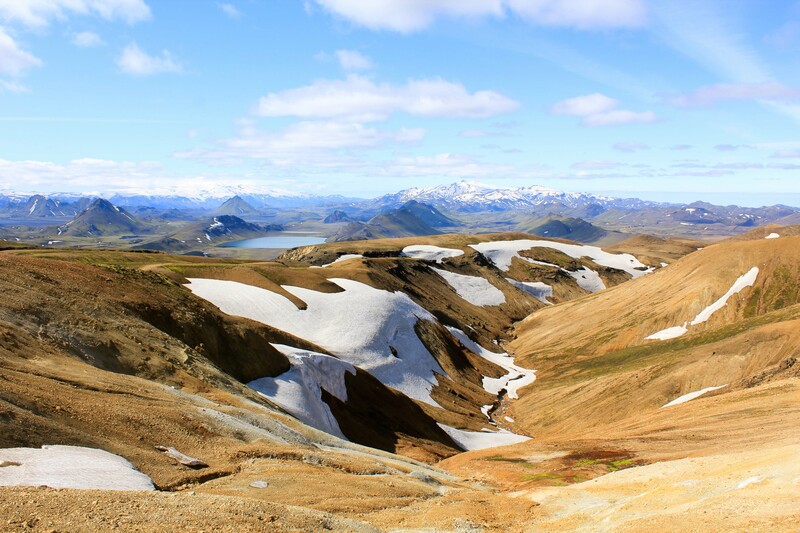 This was the end of the Laugavegur trail which starts in the Þórsmörk glacier valley and takes in the surreal highland region of Landmannalaugar, displaying the country’s legendary forces of fire and ice in an extraordinary landscape of awe-inspiring magnificence. From being enveloped in glaciers, dwarfed by volcanoes – extinct, dormant and active – having feet frozen in arctic river crossings, and boots soaked stomping through ice sheets, lungs provoked by sulphur diffusing geysers, and eyes bewildered at the multi-coloured rhylolite mountains, it is an intoxicating and humbling wilderness encounter where the forces of nature could erupt at any moment and people are bred tough. Perhaps living amongst such volatile and unpredictable geological features which can and have destroyed vast inhabited areas of land across the country at a moments notice, has created an Icelandic people who are not afraid of a few men in suits or the potential repercussions for standing up for what they believe in. While other nations injected billions of dollars into their financial institutions to keep them afloat, Iceland let them go bust with creditors paying the price, rather than taxpayers and the economy is slowly recovering. Perhaps in response to the country’s new found affordability for foreigners, the tourism industry has seen a boom during the last few years and, despite the eruption of the Eyjafjallajokull volcano in mid-2010 which caused chaos to air travel across Europe, it’s lure of adventure, beauty and unpredictability is spreading fast.